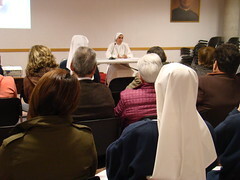 For three days, in the parish of St. John Bosco in Torrent (Valencia), a group of about 50 people, got together to reflect on the dignity of women, using the apostolic letter 'Mulieris Dignitatem' written by John Paul II. We gathered in one of the rooms of the parish hall and three Servant Sisters of the Home of the Mother explained the main content of this letter, in simple terms, so that everyone could understand. First, Sister Mª Carmen, as an introduction to the talks, spoke about true femininity, something very different from feminism, and about God’s plan for women. The talk ended with the impressive testimony of Chiara Corbella, a young mother who is a great example of a woman who surrendered herself completely to God’s plan for her, accepting the death of two children and, finally, giving her life for her third. Chiara, after learning that her third son was not going to be born with the malformations of her previous children, was diagnosed with cancer; however, she decided to delay her treatment, giving her life for that of her son. She liked saying: 'we were born and will die no more'. She was convinced of this, and when her husband Enrico asked her, shortly before her death, "Chiara, is it true that the will of the Lord is sweet?" She responded with a big smile, "Yes Enrico, very sweet." Those who knew her attest that she not only died peacefully, but happilly. In the second talk, given by Sister Ana Mª, we took a glimpse at the women in the Gospel and, in this way, we could learn from Jesus the value which He himself gave to them. We were moved by His attitude towards them, in a society where women did not have any value whatsoever, and where His own disciples “were surprised that He spoke with a woman". Later we saw the testimony of another great woman, Irena Sendler, a Polish woman known as 'the mother of the children of the Holocaust'. She, overcoming fear and risking her own life, did not shy away from the call that every woman has to protect the life of mankind, managing to save 2,500 children, taking them out of the Warsaw ghetto and hiding them with false identities with Catholic families, and in convents. The third talk, given by Sister Zdenka, dealt with the woman’s vocation to motherhood, in the physical and spiritual sense. 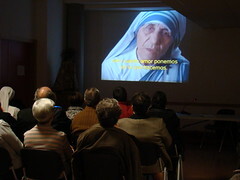 We finished with the video of a consecrated woman, Mother Teresa of Calcutta, a testimony of spousal giving to Jesus Christ and of spiritual maternity, which she exercised in an admirable way with the poorest of Calcutta. We were happy to know that all the talks shed a great deal of light and encouragement to the group of people who attended them. We heard expressions like this: "Sisters, we must continue with these talks, I don’t know why they have to stop," and "After hearing these talks we cannot be the same." We finished the talks very happy and grateful and more in love with Our Mother, the Virgin Mary, who presided over our encounters with her example as the perfect woman according to God's plan. She is the new Eve, who had the privilege of living at the same time two vocations: that of a physical mother and that of a virgin mother. Long live the Virgin Mary! 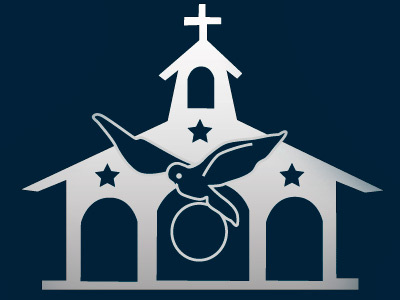 Long live St. John Paul II for the treasure he left us in the document 'Mulieris Dignitatem'! And many thanks to all the women who, with their strong love and dedication 'of mind and heart', as the Pope said, create a more sensitive and more humane world.